Request a quote for (1) Steel Leveling Pads Studded with Non Skid today. 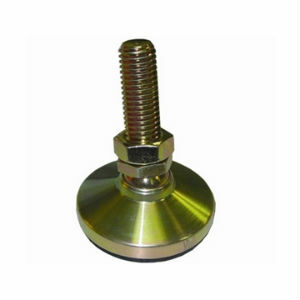 JBF National studded steel leveling pads are ideal for mounting various types of machinery including conveyor belts, racks, washing machines, refrigerators, and so much more. These levelers feature a 15 degree off center swivel, making machinery placement a cinch in bumpy and un-even surface situations. For additional protection against creep brought on by machinery vibration, this model comes standard with an elastomer anti-skid pad to ensure that your equipment stays put for the long haul. In addition to our standard gold chromate finish, we also offer black oxide, stainless steel, and nickel plated finishes to suit all mounting conditions. 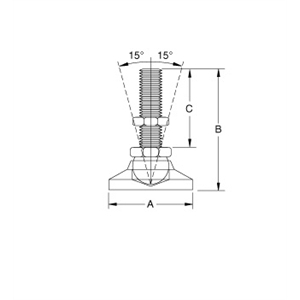 Inch and metric versions, and various stud lengths available. Please see component diagram below.